Hamberger enjoyed an exciting week of celebrations from 2 to 9 June 2016. Customers from all over the world as well as market partners, employees and friends of the company joined together to celebrate the performance and future sustainability of the company at a total of nine events. More than 3,000 guests and employees were welcomed by Peter and Dr. Peter M. Hamberger to the premises of Hamberger Industriewerke and to the Inntalhalle in Rosenheim. It all kicked off with a VIP anniversary partner day on 2 June 2016 with more than 200 attendees. Customers were able to find out about the new anniversary products as part of a specially designed programme with rotating workshops and also take a look behind the scenes at Hamberger to explore first hand the topic of successful sales at the POS. Hamberger Sanitary hosted an exhibition for its guests in parallel with a tour of the manufacturing and production of WC seats in the administration and production building in Rohrdorf. It was particularly pleasing for Hamberger to have Dr. David Bosshart from the Gottlieb-Duttweiler-Institut, Zürich, in attendance, one of the world's most sought after speakers on the topic of retail marketing. In an exceptional event location, a converted brick building designed like a loft, he spoke on the topic of "Radical customer orientation. How new consumers are changing the value added for trade and industry." Hamberger likewise arranged an interesting knowledge exchange for the partner programme that was taking place in parallel. On a visit to Marc O Polo and in the company of an expert guide in Marc O Polo CEO, Mr. Alexander Gedat, the guests had an opportunity to look beyond their everyday business and find out first hand about POS design and logistics from the famous textile company. 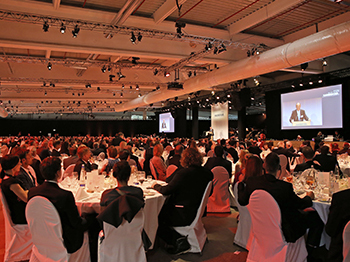 The highlight on 2 June 2016 however was the gala evening in Parquet Plant 4, which had been specially converted into a ballroom for the occasion. The evening was truly an unforgettable experience with the outstanding accompaniment of the Immling soloists, choir and orchestra. Peter Hamberger and Dr. Peter M. Hamberger proudly announced on the evening that a large donation was raised for charitable purposes to mark the 150th anniversary, which Hamberger is to top up to a total donation of €100,000. 3 June 2016 was a major focal point in terms of international guests. The workshop programme, which now includes the "Hamberger adventure trip" as its fourth main module, underscores the company's excellence as a reliable and forward-looking partner. Employees from all corporate divisions looked forward in great anticipation to the Hamberger staff party on Saturday 4 June 2016. The some 1,800 Hamberger employees, retirees and their partners who came together in the Inntalhalle, which had been specially converted into a ballroom for the occasion, thanked Peter Hamberger with standing ovations for his dedication and lifelong achievements. The three anniversary partner days the following week were again a major focal point of the anniversary workshops. Around 600 customers from Germany and German-speaking countries abroad accepted the invitation to Stephanskirchen and were treated to a dazzling array of product innovations, digital sales tools and a unique adventure trip across the company premises from the newly designed HARO showrooms to the Parquet Plant 2, which had been converted into a future lab, and on to the evening event in the brick building. The workshops were kicked off in each case by a keynote speech on the topic of "Touch.Point.Triumph" by Ms. Anne M. Schüller, one of the most renowned speakers on the topic of marketing and customer loyalty at the POS. The customers from the specialist, wholesale and flooring trade enthusiastically followed the words of the POS specialist, who kept all of the workshop participants enthralled. A relaxed celebration followed that evening in Hamberger's brick building, while a tour of the plant the following day rounded off the programme perfectly. Customers, market partners and employees alike were enthralled by an exceptional week of celebrations, with Hamberger impressively demonstrating the living reality of the motto of its anniversary celebrations "Rooted in the future for 150 years".